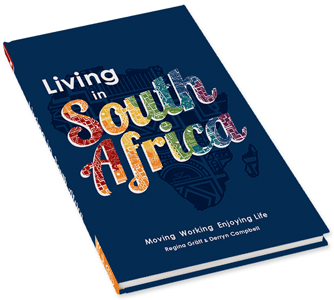 The LIVING IN SOUTH AFRICA guide book is a practical handbook containing a rich collection of facts and tips for moving to, working in and enjoying life in South Africa. This comprehensive handbook is useful to all interested in embracing life in this country. It will assist especially those in the process of relocating to and settling in this country and is a must-read expat guide for all planning to make South Africa their new home. This book is the result of a joint venture between Derryn Campbell and Regina Gräff. Regina a German expatriate and the editor of ExpatCapeTown, a website with useful tips for expats moving to the Mother City. She has lived and worked in the USA, Australia, Singapore and various European countries before she settled with her family in Cape Town in 2005. The book includes rich collection of Regina’s personal experiences and insights as an expat living in South Africa. View more details about the book on www.living-in-south-africa.com. The book contains 296 pages in colour-coded sections with plenty of graphics and photos for easy reference. You will consider this guide an indispensable tool when planning to make South Africa your new home. View more details about the contents of the book on www.living-in-south-africa.com. The book can be branded with a company’s logo and details and makes an ideal gift for conferences, international visitors and relcoating staff for companies to promote their brand. Find out more on our Branding page.